Though often disputed when factoring in the country’s coastal regions, Rome still has a reputation for being Italy’s most beautiful city. A glorious metropolitan center where ancient history meets modern influence and all manner of cultures combine to create something unique. From the stunning squares to the mind-blowing museums and undoubtedly the very best food in Europe, Rome is everything you could ever want it to be and so much more besides. 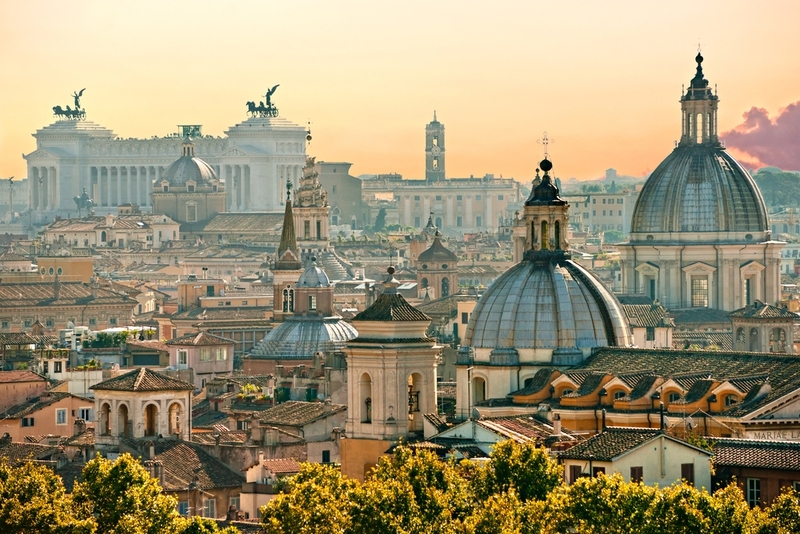 When it comes to things to do in Rome, you would never be disappointed by the city. Rome’s Pantheon isn’t always ranked within then city’s top-five ancient landmarks, though for history lovers it never fails to top the table. The fact that it is still standing after over two 2000 years is pretty incredible to say the least – especially when you’ve had chance to take in its size and splendor in person. Even right down to the beautiful marble floors – they’re the same floors visitors were walking on over two millennia ago. The Coliseum is Rome’s spectacular tribute to a time in which gladiators fought for both honor and freedom in front of bloodthirsty crowds of thousands. Admittedly the inside of the Coliseum as it stands today looks a little like someone went a bit crazy with the excavations…which they did…but you still get a great cross-section view of what was there and what took place. And even if you don’t decide to pay the entry fee, it’s pretty stunning to walk around the outside, too. The most important destination in the world for hundreds of millions of Catholics, Vatican City is in fact a separate state in its own right, though couldn’t be more characteristically Italian. If you intend to see all that’s on offer including the famed Sistine Chapel, you’ll need to dedicate a full day or so to your visit – you cannot imagine how large this place of worship really is! Now here’s where to head for a bit of a sneak peek into what it would have been like to stroll through ancient Rome where some of the era’s most important events took place. Some enjoyable, some bloody and some responsible for changing history as we know it – all however are as compelling as the last and 100% free of charge. Even if not planning to dedicate a whole day to Vatican City, it is still very much in your interests to pay a visit to the Basilica of St Peter. Head past the Swiss Guard on the door and prepare your senses from an overload, with the most elaborately decorated and undeniably decadent Catholic palace on the face of the Earth. The queues get pretty big, but it’s still free of charge. One of the things to do in Rome is to have some free eats. Ok, so technically you’re not eating 100% free of charge as you have to pay for your drinks. However, there are tons of aperitif bars around Rome that are getting in on the new craze whereby all you have to do is buy a drink and then you’re able to help yourself to all manner of gorgeous treats and nibbles. You might be put off by the prices…like in the region of six Euros per drink…but think about all the savings you’ll make on dinner. There are plenty of bars and cafes across Rome that put on live music several times each week and don’t expect any cover charge for visitors to go along. And at the same time, there’s a pretty good chance you’ll find similar performances going on across some of the city’s most famous squares. These are after all the most desirable places on Earth for musicians to pay – most would happily pay to be given such an opportunity! Among the many things to do in Rome, making a promise is one that should not be missed. You can call it every bit as cliché as you want and as it might be, but you simply cannot go to Rome without tossing a coin in the Trevi Fountain. This symbolizes the fact that someday, somehow you will return to Rome and once again enjoy the treasures on offer. And while on the subject of water, it is good to note that there are free drinking water fountains all over Rome so no matter what time of the year you go, you won’t have to pay extortionate prices for bottled water and soft drinks. Rome itself is a living museum better than any other you’ll visit in the world. That being said, there are certain examples like the Galleria Borghese that you simply must make time to visit during a stay. It’s a gorgeous 17th century villa that’s packed to the rafters with antiques and artworks that gave birth to the baroque period. There are also some amazing gardens to get lost in for a while, but you’ll need a reservation – highly worth making the effort for. Taking in the fascist architecture in Rome’s extremely interesting EUR zone. Enjoy perhaps the best view of Rome from Gianicolo Hill, where a cannon has fired every day at midnight since the end of the battle for Rome. Check out any of Rome’s most popular sights and attractions after midnight, when the crowds have departed and the stunning illuminations have been switched on. Enjoy the Roman era’s take on air conditioning by ducking out of the summer sun into any of the ancient churches you come across, which might just feature an array of quite striking Caravaggio’s.